As a Plymouth, MA-based company full of runners (and riders), the tragic events of Marathon Monday hit particularly close to home for SmartPakers, both emotionally and geographically. But if you’ve been on Facebook, Twitter or just about any other social media platform within the last few days, you’ve probably witnessed the amazing outpouring of support the entire country has been showing our city. One of our personal favorites is the repeated use of Dr. Martin Luther King Jr.’s quote, “Darkness cannot drive out darkness; only light can do that. Hate cannot drive out hate; only love can do that.” Thanks to a very cool social campaign, Bostonians now have the opportunity to show just how much light and love we have. Today has been dubbed as “Boston Spirit Day,” where Bostonians have a chance to show our strength, solidarity and pride by rocking the gear of the city we love. SmartPakers were eager to participate, and now we’re excited to share with you some photos from our day, and some thoughts about our city. Stella the Min Pin (owned and loved by SmartPaker Renee P. from Merchandising) knows that it’s not the size of the dog in the fight, it’s the size of the pride in the dog. God Bless all the people of Boston. 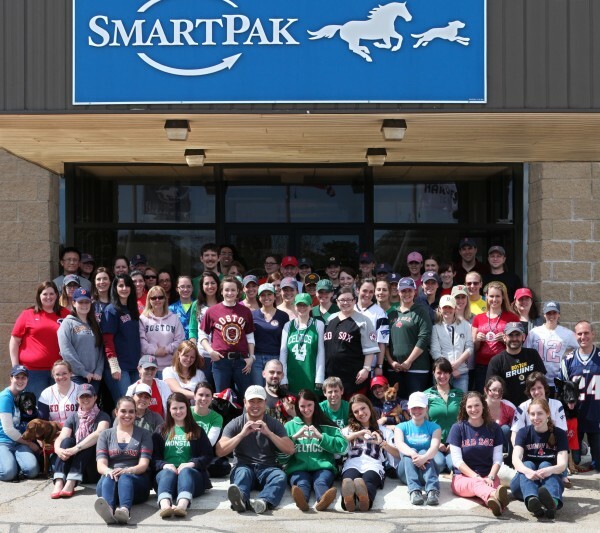 SmartPak has its roots in Boston and takes great pride in being a part of this magnificent city. It is the home of great leaders, an outstanding equestrian community, successful businesses, elite universities, wicked awesome sports teams, and most importantly strong-willed people that can overcome any challenge with morality, integrity and pride. We are honored to call this city our home and its people our family. 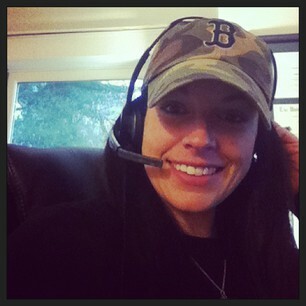 Ashley D. from Customer Care rocks a Red Sox hat (and SmartPak headset) down in the bluegrass state. 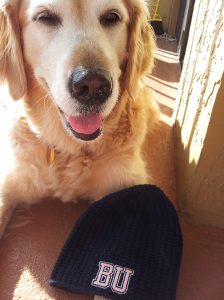 It’s too hot for winter hats in Miami, but Rose (owned and loved by SmartPaker Jen B. from Customer Care), wanted to show her Boston Spirit nonetheless! 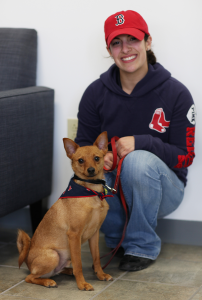 Kristina S. and Roscoe look picture perfect, which is not surprising, as they represent our Photography department. 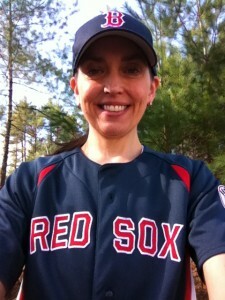 Life-long Bostonian Debbie C. from IT represents Red Sox Nation. 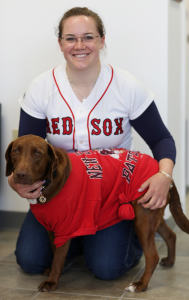 Representing our Supplement Marketing team, Casey F. and Rue have a healthy love for Boston sports. SmartPaker Brett P. (Customer Care) and her husband Anthony show off their beantown love. B-O-S-T-O-N, born and raised – my home. Boston is all I know. It is where I was brought up & has molded me to be the person that I am. For Celtics, RedSox, Bruins, & Patriots celebratory parades. As a child, constantly being taken to the historical locations to remember those that have helped create this country. Cruising on the Boston Harbor with my father after docking for lunch. It’s where I fell in love. The North End’s Little Italy is where our love flourished. It’s where I overlooked the city at Priscilla of Boston’s when choosing my wedding dress. Fenway Park is where I celebrated birthdays, graduations, and my bachelorette. It’s where I have worked before, and during college, and learned the knowhow of my trade. 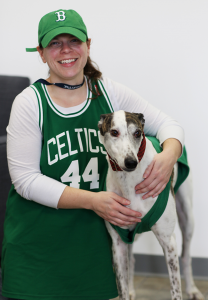 Holly A. and Amos, from the SmartPak Creative team, showed off their Celtics pride, going green in matching jerseys. 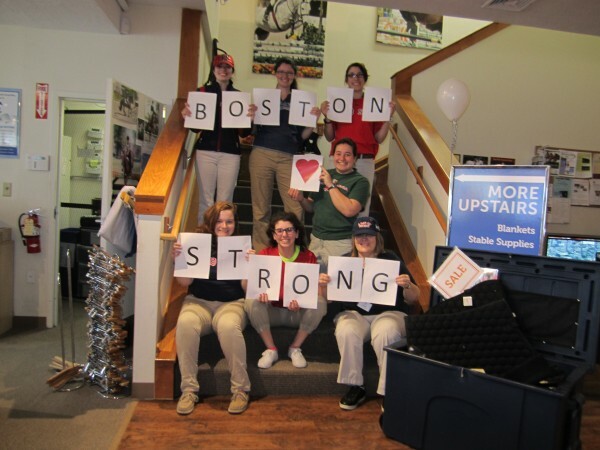 Even closer to Boston, the SmartPakers at the Retail Store in Natick were proud to showcase their Boston pride today. You Smartpakers are an amazing group of people, and I loved this tribute to your city. SmartPakers, you are wicked awesome!